Recently my wife and I took in the movie Saving Mr. Banks. The reviews were somewhat mixed but I found it delightful and moving. If you haven’t seen the movie and are worried about “spoilers” then I would ask you to stop reading now. You won’t hurt my feelings; just come back when you’ve seen it. The story is about the relationship between Walt Disney and the author of Mary Poppins, Pamela L. Travers. Walt has been pursuing Mrs. Travers for 20 years for the movie rights to her beloved nanny character. After 20 years of asking each year, Mrs. Travers agrees to a visit to discuss the movie in theory. Throughout the weeks of working on the script, Mrs. Travers holds tightly to even the most minute of details. At first, everyone just writes her off as “difficult” but when she storms home to Britain after an impasse, Walt Disney sees there’s something else going on. The best scene in the film is the one that takes place between Walt Disney and Pamela Travers in her London home. Walt has figured out that the beloved characters in the novel are based on real-life characters from Mrs. Travers’ past. Mr. Banks, it turns out, is based on her father. (The movie so far has been interlaced with flashbacks to Pamela Travers’ childhood in Australia and the struggles that her father faced, culminating with his death when Mrs. Travers was very young.) Walt also figures out that much of her difficulty with details of the movie script are tied to honoring the memory of her father. The pain of Mr. Banks’ character is her pain from over 50 years ago and it is still very real in her mind. How many of us hold on to the pain of some of the most minute details of our past? I know I’m particularly prone to this. The failures of 20 years ago sometimes come to mind unbidden, haunting me on a regular basis. And I allow them to shape what I feel about the present and even what I believe will happen in the future. In some ways, they may even become a sort of “self-fulfilling prophecy” because I just assume that what happened in the past is what will happen in the future. I expect pain, hurt, or failure and so I get pain, hurt, and/or failure. This is what my story tells me to be true. In answer to the fear of Mrs. Travers, Walt Disney makes the most wonderful promise. 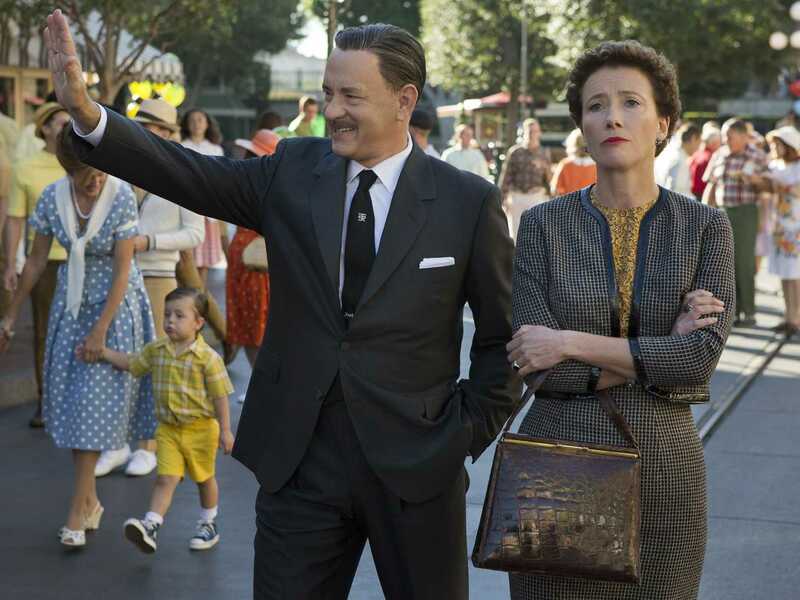 He says something along the lines of, “I can’t save your father but I can do the next best thing: I can save Mr. Banks.” With that, Mrs. Travers sees the opportunity and agrees to sign over the rights to Mary Poppins. Walt Disney can’t change the past, but he can change how future generations will view Mr. Banks, the embodiment of Mrs. Travers’ father. In a nutshell, Baptism changes our story and changes how we will be forever. Baptism cannot undo the terrible things that have happened in the past. It can’t take away those things that seem to flash into our minds unbidden, haunting us. Baptism can’t undo the past but it can do the next best thing: it can re-write our future, it can save us. In Baptism we know that our future has already been written. We have been joined with Christ in His death and resurrection and we will be raised by the same glory of the Father that raised Christ. It promises that future generations throughout eternity will remember us as beloved of God because of Christ Jesus our Lord. The movie closes with Mrs. Travers in tears as she watches the story of her childhood brought to life on the silver screen but with happier ending. Whereas her father died a tragic death, his embodiment in Mr. Banks is alive, redeemed, and preserved for future generations through the magic of cinema. For us the joy is exactly the same. The pain and suffering that we remember all too easily is gone and we are alive, redeemed, and preserved for eternity through the power of God’s Holy Baptism. In the closing scene, Walt Disney tries to comfort Mrs. Travers. He leans forward and says, “It’s all right, Mrs. Travers. It’s all right. Mr. Banks is going to be all right. I promise.” In Baptism, Christ makes the same promise to us. No matter what pain the past may inflict upon us, our story is joined with Christ and we are going to be all right.